Creations 4 Wildlife, a Newport Beach-based company founded by a 12-year-old passionate about wildlife conservation, has released a new bracelet to support Pangolin protection through WildAid. Dylan Fryer, a seventh grader at Corona del Mar Middle School has a huge heart for protecting wild animals. He forego presents and a party for his ninth birthday and raised $1,000 to help build the Tiger Trail exhibit at San Diego Zoo Safari Park. With his mom, Michelle Fryer, he's combining creativity and passion to make bracelets dubbed Creations 4 Wildlife to help support wildlife protection and conservation groups. Each handmade bracelet is made of semi-precious stones selected by Dylan and inspired by the wildlife in which the bracelets help support. 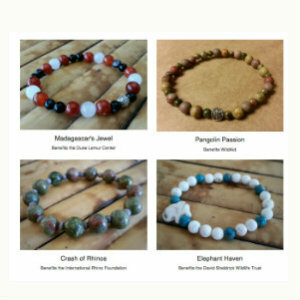 Creations 4 Wildlife collection offers 11 bracelets to help conservation of lemurs, red pandas, giraffes, tigers, rhinos, elephants, and now, pangolins. Forty percent of every Pangolin Passion bracelet sold will be donated to WildAid and 100% of the donation will go directly to WildAid's pangolin program to support WildAid's initiatives to reduce the demand for pangolin products. Based in San Francisco, WildAid’s mission is to reduce global consumption and end illegal wildlife trade. For more information or to purchase a bracelet, visit creations4wildlife, and follow the company on Facebook and Instagram at creations4wildlife.